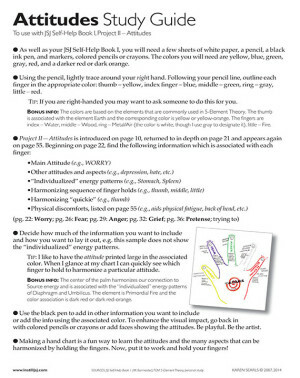 This instruction sheet will guide you through creating you own hand chart using the Jin Shin Jyutsu Self-Help Book 1. The process of creating the chart helps you to learn how and when to use holding the fingers to restore balance. Once complete, you will have an easy-access reference chart. Make Your Own Hand Chart © copyright 2014, Karen Searls. All rights reserved. The Make Your Own Hand Chart Instruction Sheet is for your personal use and does not come with distribution rights. No part of this chart may be reproduced, stored in a retrievable system, or transmitted in any form or by any means – electronically, mechanical, photocopying, recording, or otherwise – without written permission of the copyright holder.